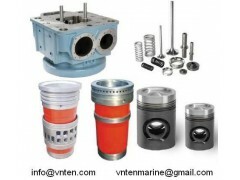 We can offer you ship engine parts, such as cylinder cover, cylinder liner, piston crown & skirt, cooling water jacket, Exh. Valve & Seat for the following Makers & Types. Most of them are in stock. The Major parts are certified by "CCS" class. PA6V280, PC2-2, PC2-4, PC2-5, PC2-6.